After an unprecedented 1,000-point decline at the open on Monday, the Dow closed with a loss of nearly 600 points. 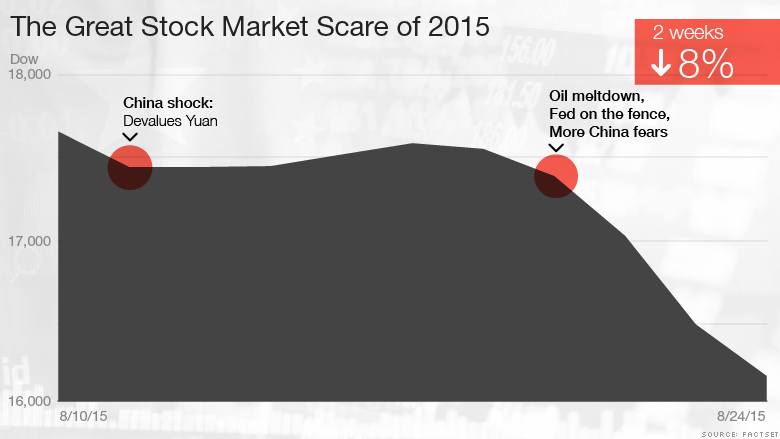 It was an extremely turbulent day for U.S. stocks driven by deep fears about China's economic slowdown. Stocks staged a comeback that nearly brought the Dow back into positive territory but that ultimately failed. 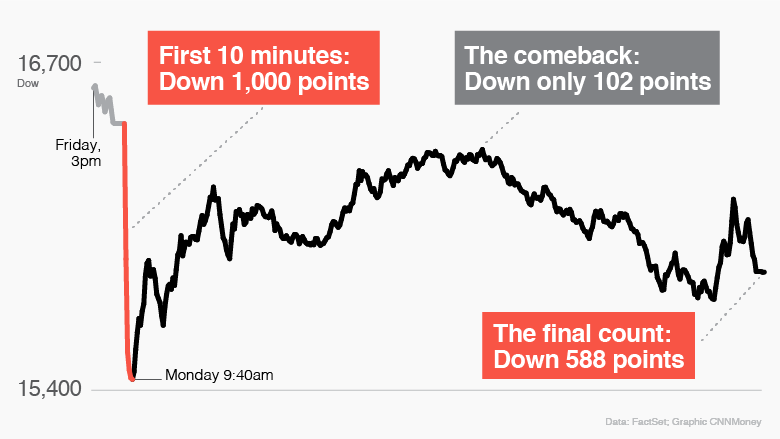 The 588-point decline was the worst for the Dow since August 2011. Global fears about China's economic slowdown are shaking stock markets around the world for a second week in a row. The wave of selling knocked the S&P 500 into correction mode for the first time since 2011 and the Dow to its lowest close in a year and a half. 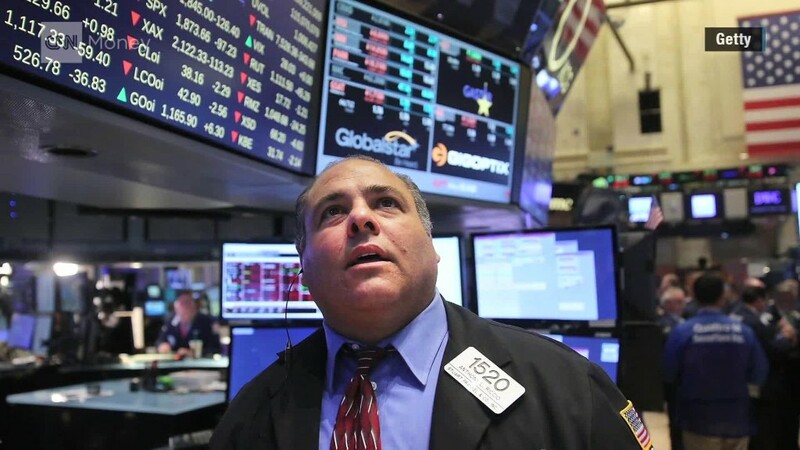 Within minutes after the opening bell, the Dow plummeted 1,089 points. That is the largest point loss ever during a trading day, surpassing the Flash Crash of 2010. "We have not seen this level of full-blown panic in markets for quite some time," said Peter Kenny, chief market strategist at Clear Pool Group, a financial technology firm. Stock prices for a number of iconic American companies declined dramatically in an instant. Shares of General Electric (GE) and Pepsi (PEP) crashed more than 20% apiece at one point, while Costco (COST) fell 16%. Dramatic declines caused stocks and exchange-traded funds to be automatically halted by stock exchanges more than 1,200 times on Monday, according to Nasdaq. The dramatic selling began overseas. China's Shanghai Composite plummeted 8.5%, wiping out all of its massive gains so far this year. Not only has an apparent bubble in Chinese equities popped, but the country's economy may be slowing much faster than feared. Last week's big selloff gathered serious momentum after China said its manufacturing activity -- a critical metric on growth -- tumbled to a six-year low in July. China is the world's second-biggest economy. Its explosive growth in the last two decades has been the engine for the global economy. Its enormous appetite for raw materials like oil, copper and iron ore fueled global growth, especially in emerging markets like Brazil that are rich in natural resources. But that story has been completely derailed by China's economic slowdown. Just how much China slows down matters greatly to investors around the world. Fears about the health of China's economy have ratcheted up to the point that the S&P 500, made up of the largest U.S. companies, is now sitting in "correction" territory -- a 10% decline from a recent peak. Both the Dow and Nasdaq fell into correction mode on Friday, the first since 2011. It's worth remembering that these steep losses come after a tremendous bull run for stocks. The S&P 500 has skyrocketed 220% since bottoming out at 666 during the Great Recession in March 2009. Even at its lows on Monday, it was at 1,866.86. Mohamed El-Erian, chief economic adviser at Allianz, believes longer term the correction will be a healthy thing for the market. "It will bring financial markets closer to what's justified by fundamentals. 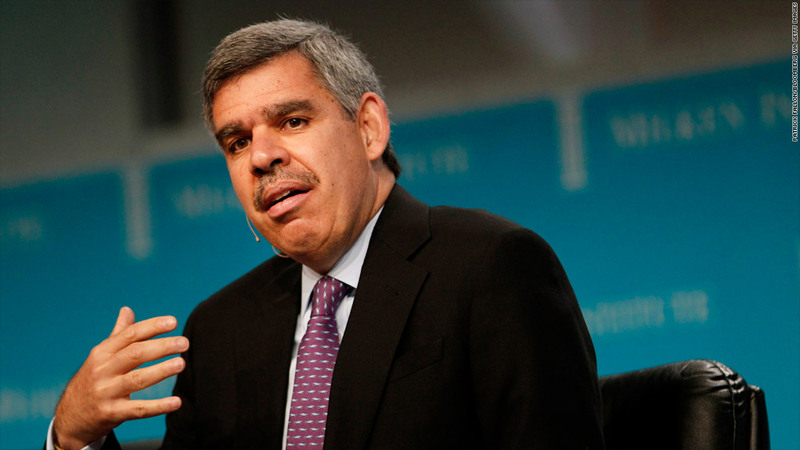 Therefore, there will be less of a risk of a financial collapse down the road," El-Erian told CNN. Crude oil plunged below $39 a barrel on Monday for the first time since 2009. It settled at $38.24 a barrel. A global economic slowdown is eating into demand for oil at a time when supplies remain extremely elevated. Another sign of fear: The 10-year Treasury yield slid below 2% on Monday. That's the lowest level since April and a sign that investors are fleeing to the relative safety of American government debt. It also signals that Wall Street believes the Federal Reserve may have to delay its expected interest rate hike from September until later in the year or even 2016. Ed Yardeni, president of Yardeni Research, believes the selloff has created an opportunity for investors "with the stomach to jump in." "I think we'll see the markets make a comeback. The fundamentals of the U.S. economy remain good, especially compared with everybody else," Yardeni said. That would mean the bull market that began more than six years ago will survive. The S&P 500 would need to close below 1,708 to be classified a bear market, which is defined as a 20% decline from a previous high. The S&P closed at 1,893. Germany, on the other hand, tumbled into a bear market on Monday. Many of America's favorite stocks are now in "bear market" territory, including Disney (DIS), Tesla (TSLA) and even Apple (AAPL).